Justus Proffit: Justus Proffit knows that world better than most, having grown up in the city’s underground punk scene. A lifer at 25, Proffit started playing in bands at 13, touring at 16, and running his own DIY space by 22. Living and creating on the fringe has deeply informed his work as an artist—the 2016 EP Magic, the 2017 EP UPS/DOWNS, his recent collaboration with Soundcloud breakout Jay Som, Nothing’s Changed—but never more powerfully than on his debut full-length, the tellingly titled L.A.’s Got Me Down (Bar/None Records, March 2019). 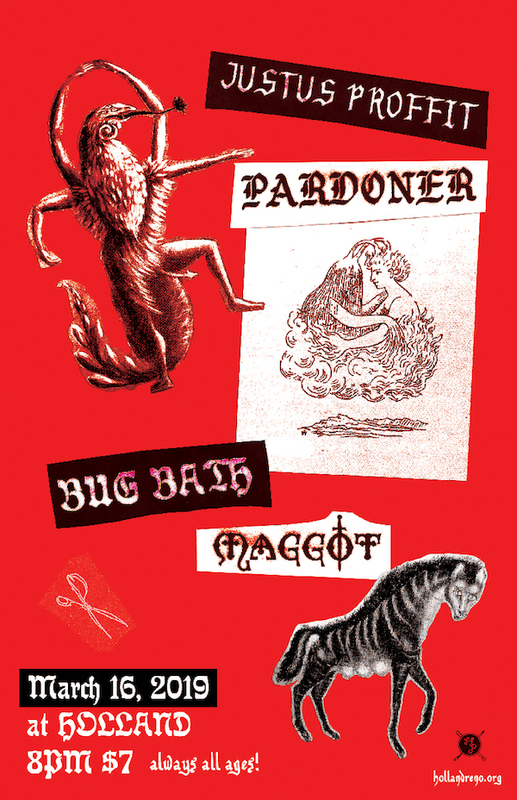 Pardoner: It’ s hard to believe that Pardoner is the first time Max Freeland and Trey Flanigan have ever played guitar in a band before. Not only do they seem to have an endless repository of ideas, but they play together like a single unit. Only drummer River van den Berghe has any prior experience, having briefly played in several high school projects before meeting the other members as students at San Francisco State University. A mutual interest in Yo La Tengo and Polvo records sparked their own experiments, and by 2015 they’ d started their own band and moved in together, hammering out songs on unplugged electric guitars in their living room. In the two years since then they’ve brought their own version of 90’ s alt rock into sharper focus, and made seemingly exponential leaps in songwriting across EP’s. Pausing only briefly from a relentless performance schedule that’s seen the band play several times in the same week, they added Will Mervau on bass and entered the studio to record what would become 2017’ s Uncontrollable Salvation.